Plante literally changed the face of hockey, but deserved far more recognition as an innovator than that. No one had as a big an impact on the world of goaltending than Plante. We all know he was a quirky loner, with his love of knitting well known. But did you know when visiting Toronto he absolutely refused to stay at the Royal York hotel, the finest hotel in the city that the Habs always stayed at? I had no idea. While in New York he once quipped that the team that gave him the most trouble the Rangers. We can see why here! Did you also know that Gump was an excellent and avid soccer player? Neither did I.
Hexy was a third generation NHL great who revolutionized the way goaltenders play the game. He was also one of hockey's great villains. Did you also know Martin Brodeur, about as nice a guy as ever played the game and who is featured in the book himself, grew up idolizing Hextall? I sure didn't. 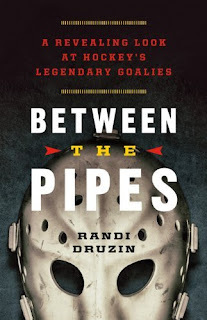 I learned these things - and so much more - in Randi Druzin's new book Between the Pipes: A Revealing Look at Hockey's Legendary Goalies, released in early October, 2013. It is a fascinating collection of stories of the most intriguing goaltenders in the history of the National Hockey League. Also included in the 300 page book are looks at Terry Sawchuk, Glenn Hall, Johnny Bower, Bernie Parent, Ken Dryden, Patrick Roy, Ed Belfour, and the chess-loving Dominik Hasek. These 12 men are the greatest goalies in the history of the NHL, making for a certain great read. Druzin is one of the most notable young journalists today, with her work being read in Time, the New York Times, The Globe And Mail, CBC, The National Post and the Toronto Star. She previously penned the book "The Complete Idiots Guide To Women In Sports." But she grew up dreaming of being a NHL goaltender herself, and her passion for both the position and the sport comes through brilliantly in her second major book release. Druzin offers mini-bios on each of these 12 masked marvels, highlighting their quirks with her trademark wit along the way. She breaks down each of their careers chronologically, but she also seeks new insight into what makes these men tick. Often the result is amazing and fun stories that will make you think differently about some of hockey's all time greats! Between The Pipes makes for an entertaining read that will leave even the most knowledgeable fan learning something new. The book was published by Greystone Books in Canada, and distributed in the United States by Publishers Group West.